If you’re interested in attending acupuncture school, you want to go somewhere that assures you’re getting the best education possible. From the courses to the instructors to the real-world experience afterward, you must be sure you’re getting the most out of this important career investment. While it can be difficult to choose a school for your training, there are some standard considerations to help with your decision. Here are six things to factor in during your search. 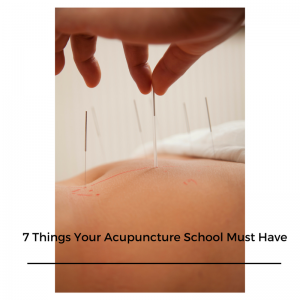 Is the acupuncture school institutionally accredited? The Accreditation Commission for Acupuncture and Oriental Medicine (ACAOM) recognizes freestanding institutions of Eastern medicine and colleges of acupuncture, so be sure to look for this accreditation. In addition to the institution as a whole, the actual program offered by the school can earn accreditation as well. Eastern medicine has a long history built upon philosophical tenets and traditions. The most renowned acupuncture schools offer a curriculum that is rooted in the long-held beliefs upon which Eastern medicine is based. By developing an understanding of this ancient medicine, it can be applied effectively in our modern world. Current research shows that adults learn best by absorbing information through hands-on activities. Your acupuncture school should be centered around meeting the needs of working practitioners, which means providing practical, class-based knowledge reinforced by clinical experience. This will aid in your retention of theoretical knowledge and your understanding of the practical application. Just like the educational objectives, the core curriculum should be rooted in the fundamentals of Eastern Medicine, as well as the principles of pathology, anatomy, and physiology. You can truly expand your medical potential by being exposed to different schools of thought, including traditional Chinese medicine and Japanese acupuncture. Many institutions understand the burden that educational costs can present when attempting to further your career. To that end, many participate in financial aid programs or offer financing options to supplement your own resources. Plus, depending on your previous credits, transcripts, essay submissions, and references, you may be entitled to a scholarship. The fact is, most schools believe that finances should not stand in the way of your future. Take a look at an acupuncture school’s faculty bios, most are available on the school’s website. Review their credentials, experience and specialties. The school’s leadership should be interested in your future success and be able to support your education accordingly. Acupuncture can provide life-changing benefits, and your journey to become a health care provider can be life-changing as well. A school that balances tradition with innovative techniques are the ones that produce holistic healers with long-lasting careers. Find that school, and that career is yours. 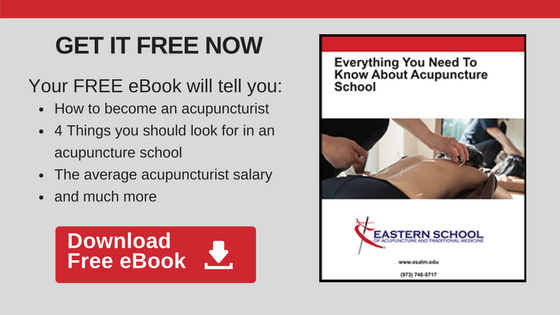 Click here for information on the Eastern School of Acupuncture.